Crise et sécurité alimentaires : vers un nouvel ordre alimentaire mondial ? The worst food crisis since 1974 broke out in 2007-08. Higher world market prices of food commodities (especially wheat, rice, soya and maize) sparked an unprecedented increase in the number of hungry people. Despite moderately lower prices since the summer of 2008, the number of the hungry continued to rise in 2009. This food crisis has placed the fight against hunger on the international agenda. Since March 2008 governments UN agencies and many social movements have adopted positions on the causes of the crisis and the means to address it. Unfortunately, while these parties are trying to coordinate their activities and suggest new approaches, the old recipes for producing more food are often brought up. Contradictory proposals are made and the thought given to the causes underlying hunger and the food crisis (social, economic and political discrimination and exclusion) has gone largely unheeded. The first Millennium Development Goal, which calls for cutting the percentage of hungry people by half by 2015, is clearly out of reach. But the food crisis might lead to a new world food order based on the three pillars of food assistance, food security and the right to food. 5. Conclusion: a new world food order for fighting against hunger? The author would like to thank Ioana Cismas for her precious help in research on source materials for this article. The author would also like to thank the Food and Agriculture Organization of the United Nations (FAO) for kindly granting permission to reproduce figures from its documentation and website (specific sources are given below each figure). 1Access to food is more than ever a question of interest. Since the food crisis broke out in 2007-08 governments, United Nations (UN) agencies and many social movements have taken up a position on its causes and the means to address it. For the first time a special high-level task force grouping all UN agency heads was set up by the Secretary-General with the goal of finding solutions to hunger and malnutrition. 2Meanwhile, States have been participating in international meetings in an effort to coordinate responses to the unprecedented increase in the number of hungry people worldwide. The food crisis has also received much attention in Switzerland. The Swiss Agency for Development and Cooperation (SDC) has increased its amount of aid directed towards humanitarian assistance and rural development and placed food security among its top priorities. Furthermore, several non-governmental organisations have launched campaigns on the food crisis and the fight against hunger (Wolf and Baumann 2008). 3The first Millennium Development Goal, i.e. to halve the percentage of people suffering from hunger and living in extreme poverty by 2015, already seemed hard to realise. Since the food crisis it is clearly out of reach (FAO 2008b, 4). 4This article seeks to place the 2007-08 food crisis in the perspective of chronic undernourishment, which has affected more than 840 million people since 1990. It will start by describing the scope and causes of malnutrition from 1990 to 2005, before analysing the statistics and causes of the food crisis. It will then present the solutions proposed by States, the UN and non-governmental organisations, while assessing their coherence and innovativeness. At a time when experts are glimpsing an emerging world food order (HRC 2008b, 32-35), I shall conclude by trying to point out the conditions for effectively coming to grips with hunger. 5Twice, in 1996 and 2000, governments unanimously and solemnly made a commitment with statistical targets for battling hunger. 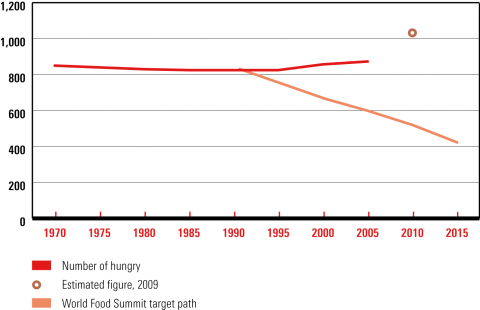 In the Rome Declaration on World Food Security and the World Food Summit Plan of Action they pledged, in 1996, to cut by half the number of the hungry by 2015.1Then, four years later in the UN Millennium Declaration they promised, in a show of modesty, to halve the proportion of the hungry by 2015 (UN General Assembly 2000, 4-6). These two commitments took 1990 as the baseline for calculating the progress to achieve. According to statistics from the Food and Agriculture Organization (FAO) of the UN, 842 million people were chronically undernourished in 1990 (FAO 2008b, 12). In Rome in 1996 States therefore pledged to scale the number of the hungry back to 421 million by 2015, whereas in the UN Millennium Declaration in 2000 their pledge amounted to reducing the number of the hungry to 591 million by 2015 (Kracht 2005, 120). 6In 2005, more than half way towards the deadline, experts reluctantly acknowledged that these objectives could not be reached (Kracht 2005, 120; FAO 2008b, 12), since 848 million people were still chronically undernourished (FAO 2008b, 12): 16 million in industrialised countries and 832 million in developing countries, with 212 million in Sub-Saharan Africa, 231 million in India and 123 million in China. These statistics include millions of children living without access to an adequate diet. Six million children die every year, directly or indirectly, from malnutrition, i.e. one child every five seconds (FAO 2005, 20). 7Between 1990 and 2005 the number of the hungry rose by six million, while their proportion fell from 20% to 16% of the world’s population (FAO 2006, 6), a decrease too small to back up any claim about reaching the first Millennium Development Goal by 2015. 8The causes of chronic undernourishment are complex. To make them easy to understand, U. Jonsson (1988, 28-35) and the United Nations Children’s Fund (UNICEF) (1998, 25-37) have proposed a useful distinction between immediate, physiological causes, underlying causes at the household level and fundamental causes at the society level (Golay 2009a, 63-67). 9The immediate causes are the lack of food eaten and the individual’s low resistance to disease. These physiological causes have to do with the person’s lack of access to enough food and its effects on health. They are the same for anyone suffering from malnutrition. 11Out of the 848 million chronically undernourished persons in 2005, 50% lived on small farms, 20% were rural families without any access to land, 10% were pastoral nomads, fishermen or persons who depended on the forest for their livelihood and 20% were living in urban poverty (UN Millennium Project Task Force on Hunger 2005, 3-4). Moreover, 70% were women (FAO 2008d). These people were undernourished because they lacked sufficient rights over productive resources (such as land, water, seeds grain, fish and the forest) or an income or benefits that would have enabled them to acquire food. 12The fundamental causes of chronic undernourishment have their roots in the structure of society. Whether historic, political, economic, cultural or even environmental (Jonsson 1988, 29-33), they explain why the most vulnerable groups in a society are deprived of rights to the productive resources necessary for gaining access to food. 14The 2007-08 crisis had its origins in the rising world market prices of food commodities, in particular of wheat, rice, soya and maize, resulting in an increase in the cost of food imports and in the percentage of household budgets devoted to food. The rising prices of foodstuffs had repercussions on local markets and fuelled an unprecedented increase in the number of hungry people in 2007, 2008 and 2009. 15According to studies by the World Bank (2008), FAO (2008b; 2008c) and the International Food Policy Research Institute (IFPRI) (Van Braun 2008), food prices rose by 40% between March 2007 and March 2008, by 56% between January 2007 and June 2008, by 83% between February 2005 and February 2008 (181% for wheat) and by 130% between January 2002 and June 2008. From March 2007 to March 2008 wheat prices rose by 130% on the world market, rice by 74%, soya by 87% and maize by 31% (FAO 2008c). 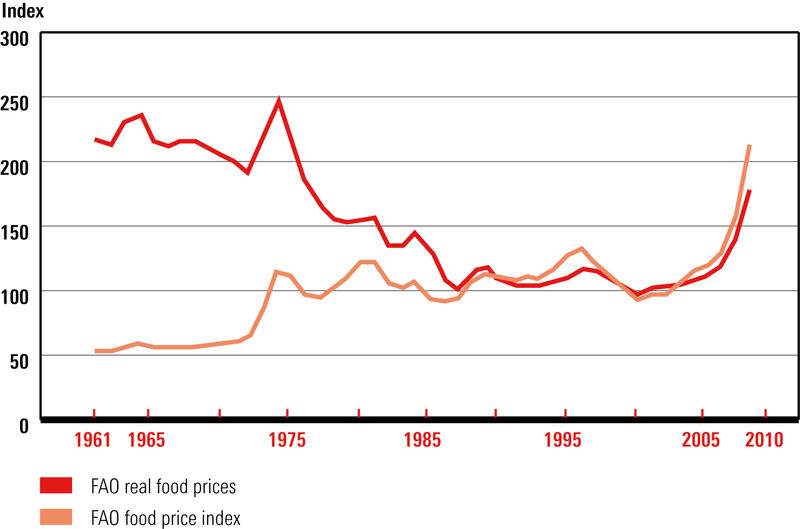 This price spike amplified the structural trend from 2002 to 2008 towards rising food prices (see figure 1). 16As O. De Schutter, UN Special Rapporteur on the Right to Food, has remarked, this situation has been exceptional: “During the first three months of 2008 international nominal prices of all major food commodities reached their highest levels in nearly 50 years, while prices in real terms were the highest in nearly 30 years, and social unrest developed in more than 40 countries as a result” (UN General Assembly 2008, 4). 17Rising world market prices substantially increased the cost of food imports, especially for countries dependent on them for the food security of their population. In the countries severely affected by the food crisis that depended on food imports to satisfy at least 40% of their needs food costs rose by 37% from 2006 to 2007 and by 56% from 2007 to 2008. In Africa they swelled by 74% from 2007 to 2008 (FAO 2008b). 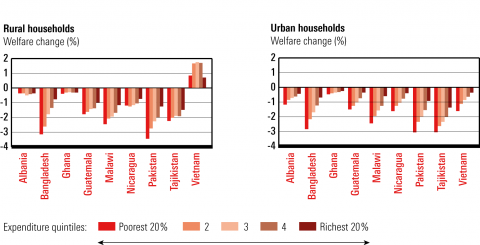 18These rising prices have also disastrously affected the ability of households to feed themselves, especially the poorest households in the cities and countryside of developing countries (see figure 2). 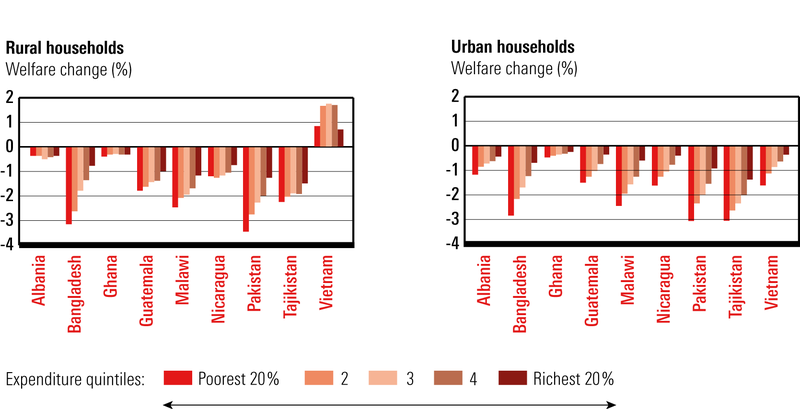 Households headed by women have been the hardest hit (FAO 2008c, 26). Note : The methodology employed is similar to that used by A. Deaton in “Rice prices and income distribution in Thailand: A non-parametric analysis” (The Economic Journal, vol. 99, no. 395, 1989, pp. 1–37) and by N. Minot and F. Goletti in Rice market liberalization and poverty in Viet Nam (Research Report no. 114, Washington, DC: IFPRI, 2000). 19Since the summer of 2008 cereal prices have fallen considerably on the world market.4 However, they have gone down less rapidly on local markets in many developing countries where, in late 2008, they were still, on the average, 24% higher than in early 2007 (FAO 2009a, 1). 20The food crisis has sparked an unprecedented rise in the number of hungry people around the world. On 16 October 2008, World Hunger Day, Jacques Diouf, FAO Director-General, announced that the 2007 food crisis affected 75 million people, thus placing the number of the hungry at 923 million at the end of 2007 (FAO 2008b, 6). By the end of 2008 40 million more people were affected, thus raising the number of the hungry to 963 million (FAO 2008e). According to FAO estimates published in October 2009, the trend has not stopped. For the first time in humanity’s history more than a billion people are now going hungry (FAO 2009b). 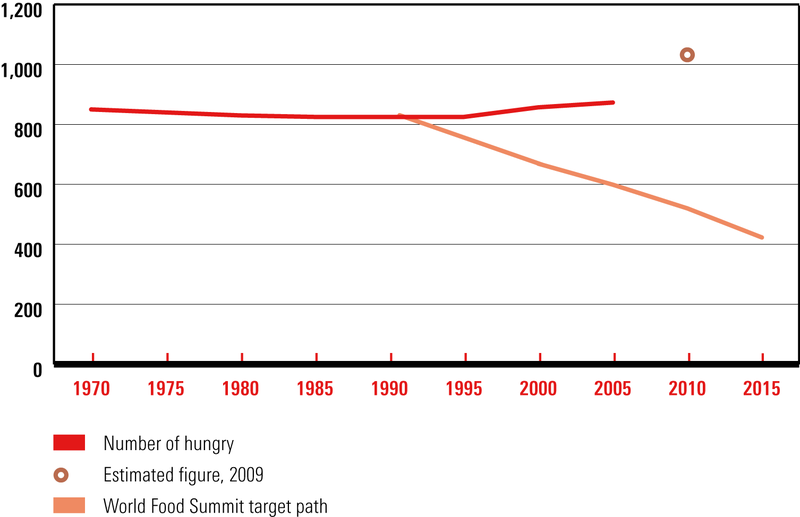 21Given this new situation, the goals of the World Food Summit and the UN Millennium Declaration definitely cannot be reached by 2015 (see figure 3). 22To analyse the factors behind the food crisis, we must distinguish between the causes of rising food prices, on one hand, and of the increasing number of hungry people, on the other. 23Much has been said about the factors driving food prices up. It seems necessary to distinguish between the causes of the structural price increase since 2002 and the causes of the price spike in the markets from March 2007 to March 2008. 25One of the first causes advanced to explain rising food prices was the growing demand for meat (China) and milk products (India) from the middle classes in emerging countries. From four to 10 kilograms of cereals are needed to produce a kilogram of meat; four kilograms are needed to produce a litre of milk. The growing demand from the Chinese and Indian middle classes automatically boosts the demand for cereals (Parmentier 2009, 121-131). Though partly accounting for the structural price increase since 2002 (Van Braun 2008, 3), this does not explain the 2007-08 spike, nor the lower prices since the summer of 2008 (Berthelot 2008). 27A second explanation, soon brought forth, attributed the decrease in the cereal supply to climate change: several years of droughts in Australia and many African lands, repeated flooding in Asia, hurricanes in Latin America and the Caribbean Basin. Like the foregoing, this cause partly accounts for the structural price rise since 2002 (Van Braun 2008, 3-5), but its impact on the 2007-08 price spike must be qualified (Berthelot 2008). 29In recent years billions of dollars, mainly in the United States (US) and the European Union (EU), have been devoted to subsidising biofuels (UN General Assembly 2007, 8-17). A third of the production of maize in the US, the leading exporter of this crop on the world market, went to biofuels in 2007 (Berthelot 2008). Biofuels have reduced the cereal supply on the world market, a trend exacerbated in 2008 when oil prices shot up (Van Braun 2008, 3). According to a World Bank report, biofuels accounted for 70-75% of the rise in food prices from 2002 to 2008, mainly because of the reduced supply of food and the replacement of crops for food with crops for biofuels (Mitchell 2008). 30Two cyclical causes played a larger part in the sudden increase in food commodity prices in late 2007 and early 2008: the rising price of oil and speculation. 32Food and oil prices have always been tightly correlated (Van Braun 2008, 3) because producing and transporting food necessitates a large quantity of energy (see figure 4). 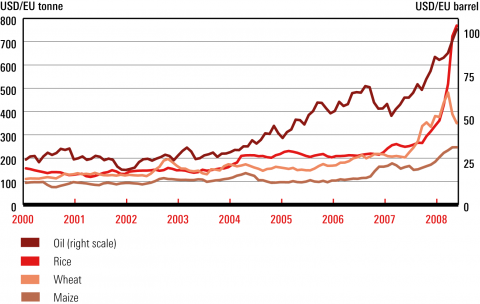 Evidence of this can be found in 2007 and 2008, when food prices reached their highest level on the world market at the same time as oil prices, i.e. 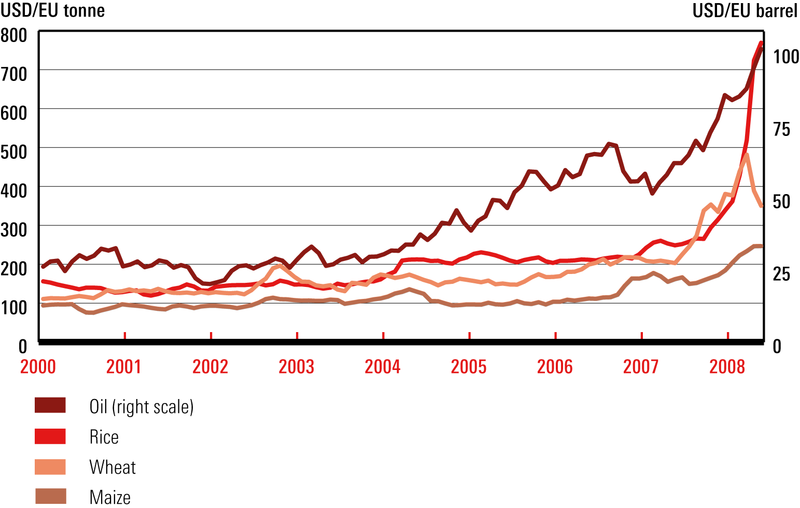 up to USD 120-150 per barrel between April and July 2008 (Berthelot 2008). Source: Van Braun (2008, 1). Note : Although there is a strong correlation between food price levels and oil price levels, this is not the only forceful relationship. Other factors, such as high demand for food due to economic growth and lack of response in production, play a role in food price increases as well. 5 World Bank, 14 April 2008. 35Most studies devoted to the food crisis have only analysed rising food commodity prices. It is taken for granted that higher prices on the world and then local markets normally make more people go hungry. However, the effects of rising food prices on the ability of households, rich or poor, to feed themselves vary from one country to another, from city to countryside. This calls for a deeper analysis, in particular, of two major causes of the growing number of the hungry from 2007 to 2009: the abandonment of policies in favour of smallholder farmers over the past 30 years and the extreme poverty in the cities of developing countries. 36Rising food prices on the world market would not have set off such a large increase in the number of hungry people if the countries concerned had not been dependent on food imports (FAO 2009a, 4). Had they invested heavily in rural development and local agriculture over the last three decades, instead of abandoning their support for smallholders, these countries could have replaced food imports with local produce. Instead of having to ride out rising food prices as consumers rather than producers, small farmers would have grown enough to feed their families, had access to the market for selling any surplus and benefited from rising prices in local markets (Oxfam 2008). 37At the time of independence several countries adopted policies in favour of farmers, while others preferred investing heavily in industry and urban centres (Brunel 2009). Given the debt crisis in the 1980s, the World Bank and the International Monetary Fund (IMF) persuaded countries in the South to open their agriculture to the world market, eliminate their support for smallholders and boost crops for exportation as a source of foreign currency for paying off the debt (Carfantan 2009, 30-35; HRC 2009a, 11-12). At the same time, between 1983 and 2006 the amount of public development funds granted to agriculture went down from more than USD 20 billion (value 2006) to less than USD 5 billion (Oxfam 2009, 10-11). 38The abandonment of policies in favour of small farmers and the opening of agriculture to the world market have had dire consequences on food security, even more so during the crisis. In Haiti, for instance, structural adjustment programmes reduced customs duties on rice imports from 35% in the 1980s to 3% in 2005, which resulted in the massive importation of (heavily subsidised) American rice and the devastation of local rice farmers, who figured among the first victims of the food crisis (Wolf and Baumann 2008, 15). This abandonment has also had dramatic repercussions in many African countries and had been blamed in part for the 2005 Niger famine (HRC 2009b, 18-19). 39The other fundamental cause of the growing number of hungry people is the extreme poverty of families living in cities in the areas affected by the food crisis. Before the crisis the poorest households devoted, on the average, from 60% to 80% of their income to food. This percentage rose in 2007 and 2008, thus drastically reducing other expenditures (especially on health and education) and sparking hunger riots in the cities of approximately 40 countries in the spring of 2008, notably in March in Burkina Faso, Cameroon, Côte d’Ivoire, Egypt, Ethiopia, Haiti, Indonesia, Madagascar and Senegal. 40To come to grips with the food crisis and chronic undernourishment, governments must base their efforts on the causes underlying these plagues: social, economic and political exclusion and discrimination. They must guarantee rural populations fair access to productive resources (primarily the land, water and seeds, but also fishing and forests). They will thus help the most vulnerable while increasing production both locally and nationally. In parallel, they must guarantee sufficient earnings or allowances to those who dwell in urban areas. 41In his September 2008 report to the Human Rights Council (HRC) the UN Special Rapporteur on the Right to Food, O. De Schutter, described the responses of national governments and the UN to the food crisis (HRC 2008b, 32-35). He pointed out three phases: an initial one of individual, uncoordinated measures, a second phase of coordination with international meetings and conferences and a third phase of discussions about a new world food order. I will present the first two phases here in chapter 4 and discuss the conditions for effectively fighting against hunger within a new world food order in the conclusion. 43From the start of the food crisis several governments adopted measures to improve their population’s access to foodstuffs (see figure 5). In response to hunger riots, some subsidised staples (e.g. bread in Egypt). Others reduced customs duties on food imports or, on the contrary, restricted such exports. At least 15 countries, including Cambodia, China, India, Pakistan and Vietnam, drastically limited their exportation of staples in order to feed their own population (Van Braun 2008, 5). Several governments announced a revival of policies in favour of agriculture (HRC 2009c). Note: Based on preliminary information collected by the World Bank staff and amended by FAO (April 2008). 44National reactions to the crisis were uncoordinated, but it is important to realise that some governments did not even have the means to take these measures in response to their population’s demands (HRC 2009a, 6). 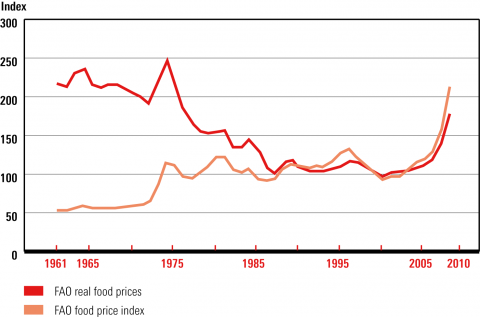 The spike in food prices most strongly affected the poorest countries, such as Haiti, which were powerless. 45A new phenomenon took place during the food crisis: the purchase or rental of millions of hectares of land in nations with a high degree of food insecurity by wealthy countries or private companies based, in particular, in Korea, China, the United Arab Emirates or Saudi Arabia (Grain 2008). The best-known example is the purchase of 1.3 million hectares of arable land in Madagascar by Daewoo, a Korean firm. This set off demonstrations and led to the ousting of the President of Madagascar in March 2008. 46UN agencies also reacted fast and, initially, in an uncoordinated manner to the food crisis. The World Food Programme (WFP) urgently called for USD 500 million to offset the rising cost of food in its budget. Due to the 40% increase in food commodity prices during a year, WFP either had to cut the number of beneficiaries by 40% or had to raise more funds. 47FAO was one of the first organisations to foresee the price spike. As early as 2007 the Director-General had floated the idea of taking action against sharply increasing food prices. FAO earmarked USD 17 million for this purpose and, at the outset of the crisis, asked for more than USD 1 billion. It wanted to raise money to help the poorest farmers acquire the supplies necessary for growing more food. 49As from April 2008 States and international organisations tried to move beyond the phase of individual reactions and coordinate their responses to the crisis. International meetings were held in Rome, Geneva, New York and Madrid. Despite the sincerity of the parties involved and the fact that all efforts converged on the need to reinvest heavily in rural development and local agriculture and to help small farmers, the solutions proposed often ran counter to each other. 8 Conference documents are available at: http://www.ransa2009.org/html/index.html. 9 For these guidelines see: http://www.fao.org/righttofood. 51The importance of the right to food in the fight against hunger was recognised in the guidelines unanimously adopted by the FAO Council in November 2004.9 It is, we might assume, to be as important as food assistance and food security in the UN approach to the crisis. These three pillars could form the grounds for a new world food order for battling hunger (HRC 2008b, 32-35). 10 See Ziegler (2001) on the schizophrenia in international organisations. 53Within two weeks during May and June 2008 countries proposed quite different approaches to the food crisis. Some called for a change of paradigm with a focus on the right to food, whereas others emphasised efforts to support local agriculture and pursue existing policies. 54On 22 May 2008, for the first thematic session in the HRC’s history, the 43 member States unanimously adopted a resolution on the “negative impact of the worsening of the world food crisis on the realisation of the right to food for all”.11 This resolution reasserted that the right to food was a fundamental human right, which member States had to guarantee to their population and in particular to the most vulnerable. States pledged to boost local production and they called on the international community to reinforce national efforts to do so. In a noteworthy passage the HRC (2008a, 4) called for “States, individually and through cooperation and assistance, relevant multilateral institutions and other relevant stakeholders, (…) to consider reviewing any policy or measure which could have a negative impact on the realisation of the right to food, particularly the right of everyone to be free from hunger, before instituting such a policy or measure”. Accordingly, the production of biofuels, speculation and the liberalisation of the agricultural sector should be reviewed in the light of their impact on the right to food (HRC 2008b). 12 Declaration of the G-8 leaders on World Food Security, Japan, July 2008. 13 For information on this meeting see: http://www.canadainternational.gc.ca/g8. 15 For information on this meeting see: http://www.fao.org/cfs/cfs-home/en. 57The 35th session of the Committee on World Food Security (CFS) then took place from 14 to 17 October, reaching a consensus on the reform of the CFS.15 With the explicit objective to improve coordination at the global level to fight against hunger, States created a new CFS open to all States, acting as members, as well as to representatives of the UN agencies, civil society organisations, international financial institutions, the WTO and the private sector (FAO 2009c). 16 For information on the FAO summit see http://www.fao.org/wsfs/world-summit/en/. 58Finally, FAO held the World Summit on Food Security in Rome from 16 to 18 November 2009.16 More than 40 heads of State and of government, along with more than 70 senior ministers, took part and adopted the Declaration of the World Summit on Food Security (FAO 2009d). In this Declaration, adopted by consensus, States tried to respond holistically to the increasing number of undernourished people. They reaffirmed each one of the solutions proposed in 2008 and 2009, including the need to reinvest in local agriculture, the right to food and the necessity for open markets. They also endorsed the reform of the CFS, with the indication that it will be an essential element of the future Global Partnership for Agriculture and Food Security. 18 For information on AGRA see: http://www.agra-alliance.org. 60Two responses from civil society have emerged to the food crisis. The first was the Alliance for a Green Revolution in Africa (AGRA). Created by African organisations and chaired by Kofi Annan, former UN Secretary-General, this alliance has received support from the Rockefeller Foundation and the Bill and Melinda Gates Foundation (BMGF). AGRA brings together agricultural research centres in Africa, universities and businesses.18 Its objectives are to improve seeds, fortify the soil, make water and markets more accessible, develop agricultural know-how and back policies in favour of smallholders. 61During the June 2008 FAO conference AGRA signed a partnership with FAO, WFP and the International Fund for Agricultural Development (IFAD). Some countries have joined in, such as the United Kingdom which has promised to put up USD 15 million over a three-year period. Japan has created a Coalition for the Development of Rice in Africa in partnership with AGRA and the New Partnership for Africa’s Development (NEPAD). The goals are to boost rice production on the continent by using improved seed grain and to reduce the dependence on food imports. 63Via Campesina has gone even further by proposing the recognition of new rights for smallholder farmers. This movement brings together more than 140 peasant organisations from nearly 70 countries and represents more than 200 million peasants. During its June 2008 International Conference on Peasant Rights in Jakarta it adopted the Declaration on the Rights of Peasants: Women and Men21 and then submitted it to the UN as a solution to both the food crisis and chronic undernourishment (Golay 2009c). 64O. De Schutter, UN Special Rapporteur on the Right to Food, sees the emergence of a new world food order as a response to the 2007-08 food crisis (HRC 2008b, 32-35). There is no denying that battling hunger and ploughing funds back into agriculture are topics now receiving attention internationally; and there is no denying that international organisations and States have made efforts to increase coordination. The creation of the High-Level Task Force on the Global Food Security Crisis for bringing together the heads of all UN agencies is without parallel, as are the reform of the CFS and the creation of the Global Partnership for Agriculture and Food Security. 65Nonetheless, the coherence and innovativeness of the solutions proposed by governments, the UN and non-governmental organisations are open to question. Let us remember that within two weeks during the spring of 2008 governments adopted radically different texts, the first calling for shifting the paradigm towards the right to food, the second giving priority to local agriculture while at the same time pursuing the very policies that led to the crisis, such as the unbridled liberalisation of trade in foodstuffs. Given this, how can we be certain that the emerging world food order will help us fight effectively against hunger? 66We must, I am convinced, start by addressing the causes underlying chronic malnutrition and the food crisis, which are often political, social and economic exclusion and discrimination. For this purpose it is necessary to give underprivileged rural populations fair access to productive resources (land, water and seeds in particular, but also fisheries and forests) and to grant to the urban poor sufficient income or allocations. But this will not suffice. Whatever the means used, they will prove ineffective if they do not include improved governance at the international, national and local levels, based on institutions with a mandate for ensuring the right to food (FAO 2009a, 4). 67Even though the World Food Summit’s objectives and the Millennium Development Goals definitely cannot be achieved by 2015, we must continue to fight against hunger and rapidly set new objectives. In the pursuit of these new objectives, the fight against hunger must be based on the three pillars of food assistance, food security and the right to food. Berthelot, J. 2008. Démêler le vrai du faux dans la flambée des prix agricoles. Unpublished paper. Brunel, S. 2009. Nourrir le monde, vaincre la faim. Paris: Larousse. Carfantan, J. Y. 2009. Le choc alimentaire mondial: ce qui nous attend demain. Paris: Albin Michel. De Castro, J. 1952. The geography of hunger. Boston: Little and Brown. Eide, A. 2008. The right to food and the impact of liquid biofuels (agrofuels). Right to Food Studies. Rome: FAO. FAO. 2005. The state of food insecurity in the world, 2005: Eradicating world hunger, key to achieving the Millennium Development Goals. Rome: FAO. FAO. 2006. The state of food insecurity in the world, 2006: Eradicating world hunger, taking stock 10 years after the World Food Summit. Rome: FAO. FAO. 2008a. Declaration of the high-level conference on world food security: The challenges of climate change and bioenergy. 5 June. Rome: FAO. FAO. 2008b. The state of food insecurity in the world, 2008: High food prices and food security, threats and opportunities. Rome: FAO. FAO. 2008c. Women and the right to food: International law and State practice. Rome: FAO. FAO. 2008d. Crop prospects and food situation. Rome: FAO. FAO. 2008e. Number of hungry people rises to 963 million. News Release. 9 December. Rome: FAO. FAO. 2009a. More people than ever are victims of hunger. News Release. 15 June. Rome: FAO. FAO. 2009b. The state of food insecurity in the world, 2009: Economic crises, impacts and lessons learned. Rome: FAO. FAO. 2009c. Reform of the Committee on World Food Security. Final Version. 14-17 October 2009. Rome: FAO. FAO. 2009d. Declaration of the World Summit on Food Security. 16-18 November 2009. Rome: FAO. Golay, C. 2008. La crise alimentaire mondiale et le droit à l’alimentation. Geneva: CETIM. Golay, C. 2009a. Droit à l’alimentation et accès à la justice. PhD dissertation in international relations (international law), University of Geneva: Graduate Institute of International and Development Studies. Golay, C. 2009b. Les droits des paysans. Geneva: CETIM. Golay, C. 2009c. Droit à l’alimentation et accès à la justice: exemples au niveaux national, régional et international. Rome: FAO. Grain. 2008. Main basse sur les terres agricoles en pleine crise alimentaire et financière. Barcelona: Grain. HRC (Human Rights Council). 2008a. Report of the Human Rights Council on its seventh special session. A/HRC/S-7/2. HRC. 2008b. Building resilience: A human rights framework for world food and nutrition security. Report by O. de Schutter, UN Special Rapporteur on the Right to Food. A/HRC/9/23. Jonsson, U. 1988. The socio-economic causes of hunger. In Food as a human right, eds. A. Eide, W. Barth Eide, S. Goonatilake, J. Gussow, and J. Omawale, 28-35. Singapore: United Nations University. Kracht, U. 2005. Whose right to food? Vulnerable groups and the hungry poor. In Food and human rights in development: Legal and institutional dimensions and selected topics, eds. W. Barth Eide, and U. Kracht, 119-139. Antwerp and Oxford: Intersentia. Mitchell, D. 2008. A note on rising food prices. World Bank Policy Research Working Paper. July. Oxfam. 2008. Double-edged prices, lessons from the food price crisis: 10 actions developing countries should take. Oxfam Briefing Paper 121. Oxfam. 2009. Investing in poor farmers pays: Rethinking how to invest in agriculture. Oxfam Briefing Paper 129. Parmentier, B. 2009. Nourrir l’humanité: les grands problèmes de l’agriculture mondiale du xxie siècle. Paris: La Découverte. Sen, A. 1981. Poverty and famines: An essay on entitlement and deprivation. Oxford: Oxford University Press. Sen, A. 2001. Food security and entitlement. Politica Internazionale, 3-4 (May-August): 19-25. UN General Assembly. 2000. United Nations Millennium Declaration. A/RES/55/2. UN General Assembly. 2008. Report of the Special Rapporteur on the Right to Food. A/63/278. UN Millennium Project Task Force on Hunger. 2005. Halving hunger: It can be done. London: Earthscan. UNICEF (United Nations Children’s Fund). 1998. The state of the world’s children, 1998. Geneva: UNICEF. Van Braun, J. 2008. Rising food prices: What should be done? IFPRI Policy Brief. April. Washington: International Food Policy Research Institute. Wolf, E., and M. Baumann. 2008. Solutions pour sortir de la crise alimentaire. Lausanne: Swiss Catholic Lenten Fund and Bread for All. World Bank. 2008. 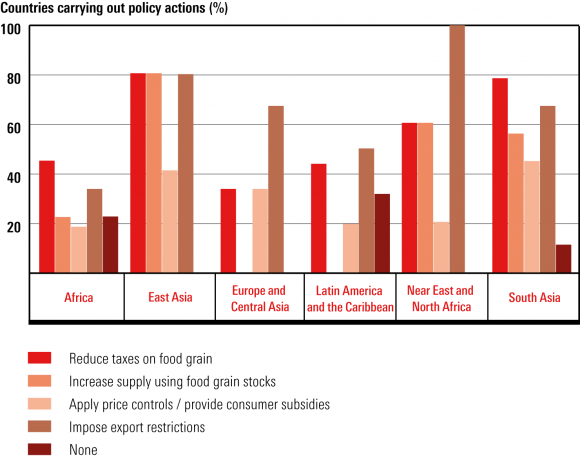 Rising food prices: Policy options and World Bank response. Washington: World Bank. Ziegler, J. 2001. Schizophrénie des Nations Unies. Le Monde diplomatique, November. 1 Paragraph 7 of the Rome Declaration on World Food Security and paragraph 7 of the World Food Summit Plan of Action (FAO 1996). http://www.fao.org/docrep/003/FAFA/w3613e00.HTM. 2 See J. Ziegler’s field reports on Brazil, India and Bangladesh available at: http://www.righttofood.org. 3 J. De Castro (1952), Chairman of the FAO Executive Committee from 1952 to 1956, was among the first to show that chronic undernourishment was to be attributed not to the climate but to political, economic and social factors. 4 The most recent FAO statistics can be consulted at: http://www.fao.org/worldfoodsituation/FoodPricesIndex/en/. 6 J. Ziegler fielded the idea of a moratorium in his report to the UN General Assembly in October 2007 (UN General Assembly 2007, 8-17). Several experts supported it (Eide 2008). 7 Information about the High-Level Task Force on the Global Food Security Crisis can be found at: http://www.un.org/issues/food/taskforce/. 11 HRC, The negative impact of the worsening of the world food crisis on the realisation of the right to food for all, A/HRC/S-7/1, is included in HRC (2008a, 3-5). 14 G-8, L’Aquila joint statement on global food security, 10 July 2009. For information on this summit see http://www.g8italia2009.it. 17 For more information about this programme see: http://www.ddc.admin.ch/fr/Accueil/La_DDC/Organisation/Cooperation_globale/Programme_global_Securite_alimentaire. 20 In Switzerland, for example, Swiss Catholic Lenten Fund and Bread for All have launched a three-year campaign on the right to food with as its focus: in 2008 the need for public policies, in 2009 the impact of climate change, in 2010 the impact of trade. Information on this campaign can be found at: http://www.droitalimentation.ch. Christophe Golay, « The Food Crisis and Food Security: Towards a New World Food Order? »,International Development Policy | Revue internationale de politique de développement, 1 | 2010, 215-232. Joint Coordinator of the Project on Economic, Social and Cultural rights at the Geneva Academy of International Humanitarian Law and Human Rights; Visiting Lecturer at the Graduate Institute of International and Development Studies in Geneva; from November 2001 to April 2008 he was Legal Adviser to the UN Special Rapporteur on the Right to Food.